GBV take the A-side of this split 7'' with Massachusetts indie rock band, New Radian Storm King. GBV covers NRSK's "The Opposing Engineers (Sleep Alone), while NRSK cover "I Am a Scientist" on the b-side of the 7''. 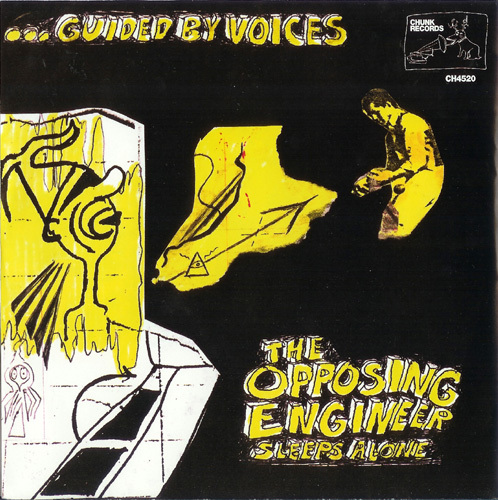 The Opposing Engineers (Sleep Alone)­ - 3 Cover track alert! One that remains fairly true to form too. Airy verses, and big choruses that aren’t very interesting. Cool bass and guitar interweaving on the track. Slow, slacker-tinged outro with soaring Pollard vocals is the coolest part of the song. Not particularly worth tracking down though.